Alaska's climate varies across the state, and in some areas conditions are extremely challenging for flowers. Fairbanks and other interior and eastern areas experience rainfall as low as 12 inches per year, and average temperatures range from -20 to -30 degrees Fahrenheit in winter to 70 degrees Fahrenheit in summer. In Anchorage and other coastal areas the climate is cool and moist, and in Juneau in the southern panhandle it's wet and comparatively warm. Gardens will look best with flowers that grow within the local U.S. Department of Agriculture plant hardiness zone and conditions. Annual flowers grow in most areas of Alaska. A few flowers grow well in Fairbanks and other interior areas of Alaska in USDA zone 2. Arctic poppy (Papaver nudicaule var. croceum), which grows in USDA zones 2 through 7, is a short-lived perennial that survives the chilly winter temperatures of the state's interior and tolerates its hot summers when given some afternoon shade. Arctic poppy grows 12 to 24 inches tall and 9 to 12 inches wide, and bears saucer-shaped blooms with crinkled petals spring through early summer in a variety of colors, depending on the variety. Single-flowered hollyhocks (Alcea rosea) also tolerate very low winter temperatures. 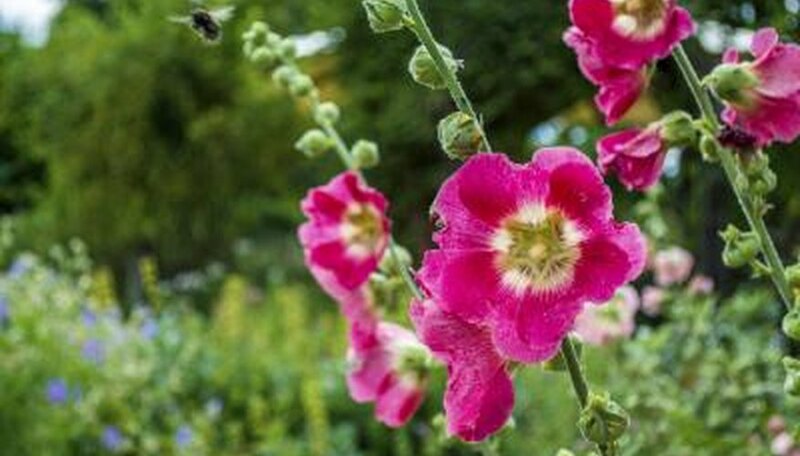 Single hollyhocks are hardy in USDA zones 2 through 10, and produce red, pink, white and light-yellow blooms on spikes up to 8 feet tall early through late summer. Single flowers have one layer of petals surrounding the center. Water Arctic poppies and hollyhocks regularly to maintain moist but not saturated soil conditions. Sea winds moderate summer and winter temperatures in coastal areas of Alaska. Black-eyed Susan (Rudbeckia hirta) and blue star (Amsonia tabernaemontana) grow well in Anchorage, which is USDA zone 4, and in areas with slightly cooler winter temperatures. Hardy in USDA zones 3 through 7, black-eyed Susan produces daisylike blooms in mid through late summer and grows 2 to 3 feet tall and 1 to 2 feet wide. Flower colors include orange, bronze, yellow, red and bicolors, depending on the variety. Blue star grows in USDA zones 3 through 9, bearing starlike, soft light blue late spring flowers on clumps of foliage 2 to 3 feet tall and wide. Juneau and other areas in the southern Alaskan panhandle experience mild temperatures and receive up to 200 inches of rain a year. Plants that grow in there and other areas of Alaska in USDA zone 7 include cardinal flower (Lobelia cardinalis), hardy in USDA zones 3 through 9, and bee balm (Monarda didyma), which grows in USDA zones 4 through 9. Cardinal flower grows 2 to 4 feet tall and 1 to 2 feet wide, and blooms with spikes of tubular scarlet red, rose or white flowers mid through late summer. Bee balm displays globes of red flowers in mid-summer and grows 2 to 4 feet tall and 2 to 3 feet wide. Both plants tolerate wet conditions. Annuals grow almost everywhere in Alaska in summer. In frost-free areas, annual plants can be grown from seed or bought as bedding plants. Plains coreopsis (Coreopsis tinctoria), nasturtiums (Tropaeolum spp) and pot marigold (Calendula officinalis) grow quickly from seed and flower all summer. Plains coreopsis grows 2 to 4 feet tall and 1 to 1 1/2 feet wide, and produces daisylike flowers with reddish-brown centers and yellow rays. Nasturtiums grow as vines up to 10 feet long or in sprawling bushes up to 3 feet wide, and bear flowers in sunset colors or white. Pot marigold flowers are daisylike, single or double and yellow or deep orange, and plants grow 1 to 2 feet tall. Sow annual flowers indoors six to eight weeks before the average final frost date for the earliest flowers.